Teach your students about the power of kindness with Children's Worship Bulletins Sunday school bulletins. These activities are taken from the Bible including the Old Testament, all four Gospels and the Epistles. Your children will learn about how kindness plays an important role in their lives and in the Bible. You'll find that the activities in our bulletin not only educate your students about the Bible, but they are fun as well. If you keep students engaged and enjoying themselves, they will find a greater understanding and retain more of what they have learned. We retain much more of what we do than of what we hear. One example of our Children's Worship Bulletins about kindness is below. Print out the answer key, if needed. Hand out the bulletins and pencils. Give directions, "Connect the dots. The first team to complete the puzzle correctly wins. GO." Read the answer together as a class. Hand out prizes to the winning team. Reinforce the lesson by opening up a discussion about kindness. "God set an excellent example of sacrificial kindness. How do you feel when someone is kind to you? What can we do to show kindness to our families this week? How can we be kind at school?" You will never be at a loss when it comes to Sunday school activities about kindness or any other biblical topic. Here at Children's Worship Bulletins, we have hundreds of bulletins available, including codes, mazes, pictures, puzzles and word pictures. 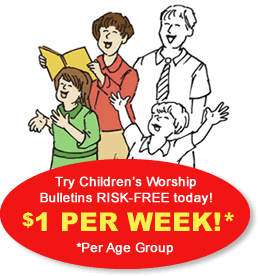 With a membership to Children's Worship Bulletins, you can download as many bulletins as you would like. Our library allows you to search by Scripture or topic, such as kindness. In addition, our bulletins come in color or black and white. The choice is yours.